On Saturday the 24 May, and after getting a tip from trusty Rob at Paul's Fishing Kites about the prospects of decent fish to catch at Te Arai Point, my good mate Shane decided to take his friend Steve kitefishing. It was to be Steves first kitefishing trip and he was keen to see how Kitefishing and the Target Snapper Hooks work. As kitefishers do, they spent the trip constantly watching flags to determine the wind direction and strength and were eager to get their gear out. However, it just didn't look quite right. On arrival at the beach their fears were confirmed, the wind was blowing directly down the beach. Employing all of Shane's kite flying skills, they were able to set the kite on the maximum possible tack and achieve a fishable setting angle on Shane's 65kg Dropper Rig. Unfortunately the wind died away completely before they had a chance to set it. Well, it was already late but these keen Westies were not leaving without a feed, the decision was made to wait and see what happened as the wind often gets up after dark. It was a to be a long wait, it was around 2.30am before the wind finally picked up again. Shane and Steve had prepared their bait in Shane's secret marinade of natural oils and salt. They had a mixture of bonito, mullet, kahawai and squid baits. Photo Above : Patience, Shane's expertise and local knowledge were more than rewarded on their last kite fishing trip to Te Arai Point. Fishing close to the rocks at Te Arai Point should only be attempted with sand Dropper Rigs by those who know the area or with Dropper Rigs fitted with sacrificial ledger rigs by those who are not familiar with the area. Above Steve displays some of the catch taken on their all night expedition. As the wind had changed to a more offshore direction as it had risen a tack was no longer required. Photo Above : The results of another late night session, taken earlier in the month by Shane and a group of his friends on his Dropper Rig. They decided to set only ten hooks as they were setting close to an outer reef connected to the point. Their first set was successfully deployed at 3am. The first set was 1000 metres offshore and fished for an hour and a half. During retrieval the gear was very heavy but they were unsure whether this was due to the wind strength or fish. As the first of the hook section came in they realized it was not the wind. Their grit and determination had paid off big time. Most of the weight had obviously been caused by the magnificent 19 pound snapper which had taken the 3rd hook. They also had a few 35 - 42 cm snapper on the line. With a start like this the two excited kitefishers quickly set out the second set to the same area. Incredibly their catch on the second set was even better. They landed another fantastic snapper, which tipped the scales at 17 pounds, a 10 pounder plus a couple of 8 pounders. Ian Mac Donald was out at Muriwai three weeks ago, during the last period of easterlies with his Bottom Longline Rig. He reports he had a great day setting his longline out three times. Using a mixture of mullet, squid and kahawai for bait they caught 33 snapper in total, two gurnard, four kahawai and a couple of trevally. There were three snapper on the first set, 15 on the second set along with gurnard and kahawai and 15 snapper on the last set. Two trevally were also brought in on the last set. Ian says the snapper were all over the legal size limit but they returned five snapper to the water during the day. The east coast is a different story. Ian Mac Donald also took his family to Orewa for the day last Sunday and set his Bottom Longline Rig. Unfortunately nothing came in after an hour of waiting. So Ian decided that was enough for the day. He was not the only one struggling last weekend; Tony Talbot from the Kite Fishing Club was up at Te Arai Point last Monday. He had the place to himself so set his gear out for two hours. With the wind just right Tony thought he would be into some good snapper but only caught two gurnard. Tony did win the prize for the biggest fish caught for the month from the Kite Fishing Club for May. 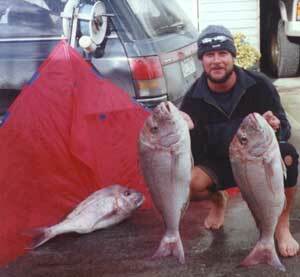 This was secured with his 7Kg snapper caught at Muriwai Beach. There were some good fish recorded by club members last month with a lot of fish in the 4 to 5Kg range. Well, we had a poor Queens Birthday weekend with both the weather and the sea. A few brave soles tried on Sunday, two kites sets were up, one was Harry Job and a few with Kontikis also tried their luck. The Kites were the only successful ones as we had a very strong southerly rip, which defeated all efforts with the Kontikis. According to my reports Harry caught 6 gurnard and a few rig. The unsuccessful Kontiki boys came in to the shop to check out the kite range. The only other success was in the river where a number of large flounders were taken. Over the Weekend we had a few visitors from around the lower North Island checking our beach and stocking up on some kite equipment, all of them liked what they saw, as they said they would be back. The pips are still on the beach so the snapper won't be far away. Crayfish are still on the bite in the area so it is worthwhile throwing a pot in at low tide around at the rocks. Don't forget if you are in the area call in to record your catch, have it photographed or have a chat and have a look over Paul's Fishing Kites range of products, if you have time you can watch Paul's Video. David Billings from the Kite Fishing Club advises the red sack weed is back off Uretiti Beach. Patches of it have also been reported on the southern side of Te Arai Point. David and Robbie Cullen set their gear between 800m and 1500m out. David spent two hours bringing in his Bottom Longline from 800m out and the weed was four to five centimeters thick around the mainline. In 25 knots of wind and using a Large Skyhook the gear was stalling there was so much weed to contend with. The red weed seems to be in patches but David said it is very hard to tell where exactly the weed is or where it is clear. The good news is David still managed to bring in some gurnard and a small kahawai. 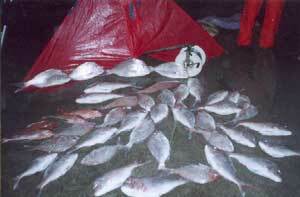 Those fishing close to the river mouth report there are plenty of kahawai about. The past summer has been the best season for kite fishing ever. With periods of constant wind the kite fishing has been hugely successful on both coasts. We have had more easterlies for longer periods, which means those that prefer fishing on the west coast have been getting into some great fishing. The east coast has been producing many good fish as well. Don't forget to send in your reports and photos to be in to win our prizes on offer. Paul's Fishing Kites were at the Auckland Boat show last weekend. It was an excellent opportunity to meet many of you who read these newsletters every week and get your feedback. All those who gave us their emails to subscribe to the weekly newsletter went into a draw for a chilly bin full of prizes. The draw has been done and the lucky subscriber is Allan Danbrook. Congratulations to Allan. We hope you enjoy your prize and thank you to all those who participated.